Save Upto 50% On Retail Prices! We Stock The Leading Big Brands! Clock in within seconds with our robust hand reader. Advanced level time & attendance solution. TouchTime 1000 Wifi is a best selling robust, fully featured clocking in machine solution. It has all the same great features as the TouchTime 1000 however with added Wifi connection. It has holiday and sickness calculations, network ready, Fire Roll Call, Sage Payroll Import, additional Payroll Export, Key Personnel Displays & 12 Months free Support from Time Systems UK. Robust & secure hand reader Eliminates "buddy punching"
Please see "Software Comparison" for advanced features. Each employee presents their hand to the terminal, it is compared to a previously enrolled template and once recognised this creates an in/out transaction. The terminal displays the result of the attempt along with an audible message. 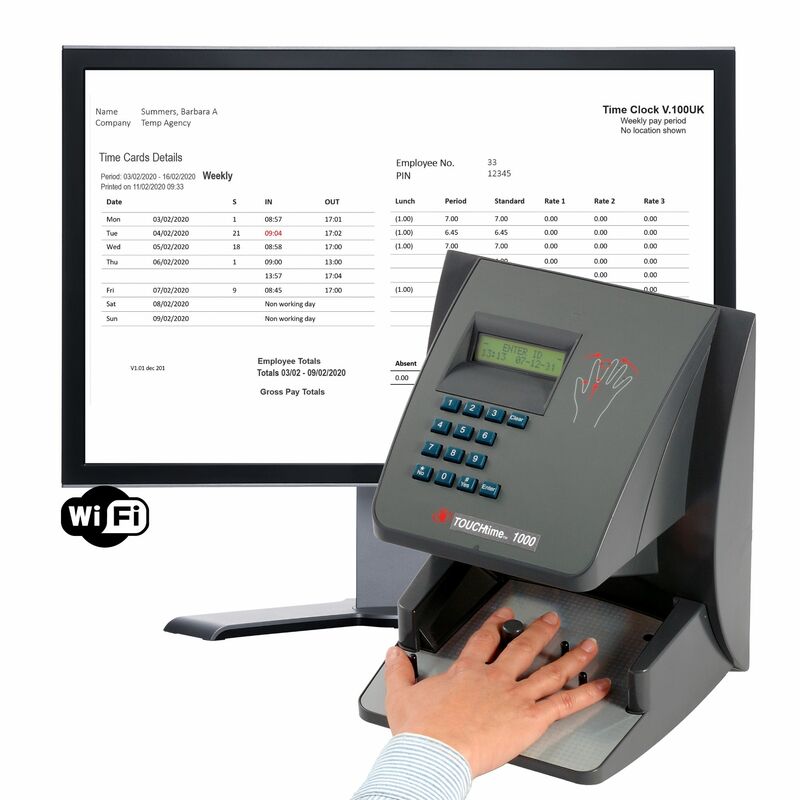 TouchTime 1000 Wifi Pro & Ultimate software also allow authorised personnel to add, modify or delete those transactions at the PC. GDPR compliant. Does not store hand prints or other Human Indicators. Calculates hours worked, sorts into standard and overtime - even deducts for any breaks so you don't have to! User definable automatic Holiday and Sickness for days absent. Can be implemented or adjusted after the event. Highlights missed clockings, lateness, sickness, holiday, unauthorised absence, breaks exceeded and early departure etc. Overtime can be applied by time of day, day of week, after x hours per day, after x hours per week. Also allows you to add, edit or delete transactions - easily add transactions for drivers and remote workers. Overtime can be accrued by number of hours worked, by time of day (time band), by shift, day of week and pay period. Multi-user software option - with user access permissions. Run automatic, on demand and up-to-date fire roll call reports in cases of emergency. Our fire report gives you greater confidence by allowing an instant roll call if required, this is great for Health and Safety. The Fire roll call report automatically documents every transactions as they happen for an accurate, on the spot roll call. Run on multiple PC's each with it own selection of employees. This report can be set to run automatically or on demand. See in real-time who is on or off the premises - have this utility running on multiple PCs in your company so anyone can see who is 'IN' or 'OUT'. Now there is no need to go looking for someone - see them on screen the moment they clock in. You can allocate an employee to a shift pattern in an automated setup or use a drag and drop calendar. An employee can be different shift every day. The drag and drop shift rostering calendar allows you to change employees shifts with a click and make 'on the fly' amendments easily. TouchTime 1000 Wifi software has intelligent rounding rules so you only pay for the exact time worked. Round forward/back for late arrivals, long lunches, early departures, lunch not taken - so you only pay for the hours worked. Summary time cards, detailed time cards, fire roll call reports and more! See the reporting tab for full details. Prints full time card activity report - many different report options - including terminal used, shift applied, and missed clockings. Reports automatically highlight missed clockings, lateness, sickness, holiday, unauthorised absence, breaks exceeded and early departure etc. Reports highlight lateness in red or bold. Prints full time card summary report for any selection - for viewing but mainly to create export for payroll programs. Run automatic, on demand and up-to-date fire roll call reports in cases of emergency. Our fire report gives you greater confidence by allowing an instant roll call if required- great for Health and Safety. Whos not 'turned in' reports - don't go looking for them - find out instantly - just run report or look at the on-screen attendance display- it tells you. Make sure your records are up to date with this report. This way you can be sure your payroll will be right and not have missing data. 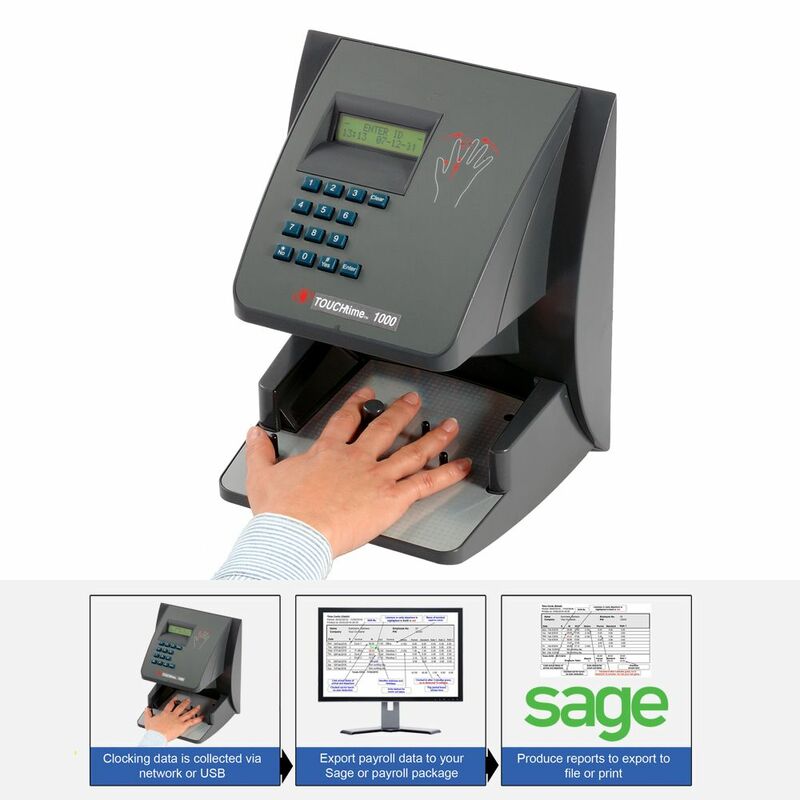 TouchTime 1000 Wifi comes complete with PayStandard Software - Our Sage Payroll import program. With a PayStandard payroll link these figures can be imported into Sage Payroll, safe, reliably and automatically. PayStandard allows you to import all hours worked for all employees into the 'Enter Payments' section in Sage Payroll. This is done with the click of a button, takes seconds to complete and the data entered is then subject to your acceptance or refusal. So you maintain complete control over the matter. PayStandard can save your payroll department hours of lost time in manual data entry. You can export your time card and other data from TouchTime 1000 Wifi for use in other payroll packages or Excel spreadsheets. TouchTime 1000 Wifi exports all data to a file in CSV format for use in Excel and almost all known payroll systems. TouchTime 1000 Wifi Automatically calculates the correct figures for payroll. Data can also be exported for use in third party software such as HR and Personnel packages. Print or view information on screen and save reports to disk for later review or use elsewhere. TouchTime 1000 Wifi software only operates on Windows platform and is multi-department, multi-company and can run on a stand-alone PC or networked. Standard Windows Intel-compatible processor (Intel, AMD etc), 1gb RAM, 200MB hard disk space free, an available and suitable CAT5 network port (for hardware equipped with a network port), communications "COM" port or USB port when using USB to COM adapter or connections. Operating systems supported must be properly licensed, legal and current copies of Windows 7, 8, Windows 10; desktop versions. This product is not sold to work on beta or preview versions of Windows, Windows Vista, Windows RT, Windows for devices or emulation packages such as the WINE project, thin client or virtual environments. All operating systems must be 32bit or 64 bit with no sub-systems restrictions. ​​​​​​Below is a software comparison for software options that will come with your new terminal. Once you have decided which software will best suit your needs simply select it from the drop down menu above.